Characters of the DC Universe become animated mini figures and fight crime in LEGO Super Heroes: Justice League vs. Bizarro League. Everything is turned backwards after Lex Luthor uses a duplicator ray to create Bizarro, an opposite-speaking child-like character who struggles to fit in with the superheroes. But when Bizarro creates duplicates of all the Justice League members, it will take a lot of strength (and quite a bit of patience) to combat the most dangerous force in the universe. 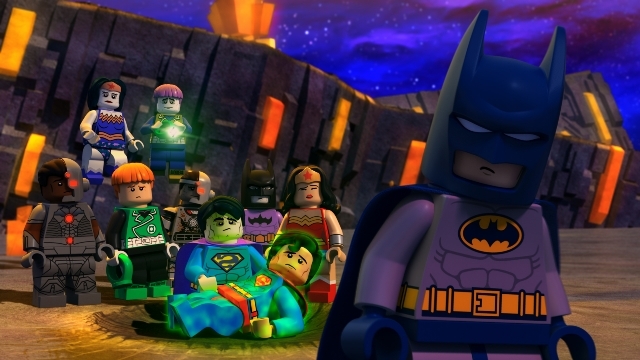 This story introduces Bizarro to the Justice League for the very first time in the LEGO animated universe. Opposite versions of the good guys include: the World’s Worst Detective, an ungraceful warrior, a scaredy cat and a low-tech (almost steampunk) superhero. Nobody knows, exactly, how to interpret these new characters’ actions. The Bizarros are the ultimate underdogs, simply the worst elements of the good guys, come to life. Darkseid is featured here and quite enjoyable as an antagonist, but many of the Legion of Doom bad guys are sadly wasted here, briefly appearing in an introductory battle, then disappearing for the remainder of the movie. The all-too-brief storyline only lasts for 49 minutes and would have better suited to have them return, in some capacity. Supplementary features include an entire animated TV special, the Bizarro backstory, along with an intentional gag reel. There’s plenty of family-friendly fun here, featuring a few new characters who haven’t been showcased before. A follow-up LEGO movie is possibly foreshadowed, but what, exactly, is Operation Doom? Tune in to find out next time! Strength: Good animation, fun characters. Weakness: Storyline is too short and shortchanges some great villains. WTF Moment: Prepare yourself for an onslaught of chicken jokes.